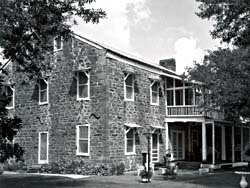 Whitehall, an outstanding example of mid-19th-century architecture, was constructed in 1848 as the residence of Joseph H. Polley, prominent early Texas colonist and rancher. The New York native came to Texas in 1824 with Stephen Austin and other colonists from the United States. In 1848, Polley and his family moved to the Cibolo Creek Valley east of San Antonio, where they were the first Anglo settlers in the area. Whitehall is a rare surviving example of a Greek-Revival influenced mansion from the antebellum period of Texas history. The detached kitchen, older than the main house and constructed of hand-hewn oak logs, remains as well. Whitehall is operated as a museum, and is located in Sutherland Springs, east of San Antonio on Hwy 87. Whitehall has also been documented by the Historic American Buildings Survey.